Personally, I find it harder to get into more serious historical dramas compared to a playful rom-com. However, I was instantly drawn to Mirror of the Witch‘s premise: a cursed princess is hidden away in the forest, and she must overcome the evil shaman to lift the curse and change her fate. This fairytale-like concept and the bewitching fantasy vibe instantly caught my interest. The fairytale-like concept and the fantasy vibe instantly caught my interest. The supernatural elements of shadow spirits and curses also do a great job setting a dark undertone for the drama. However, that is not to say the whole drama is murky; we do get lighthearted moments and a sweet romance that blend in well with the eerie theme. To top it all off, the acting from both the leads and supporting actors are believable and natural. Mirror of the Witch is an all around enjoyable drama besides the occasional lag in pacing and questionable character motives. We delve right into the action-packed plot within the first four episodes of Mirror of the Witch. 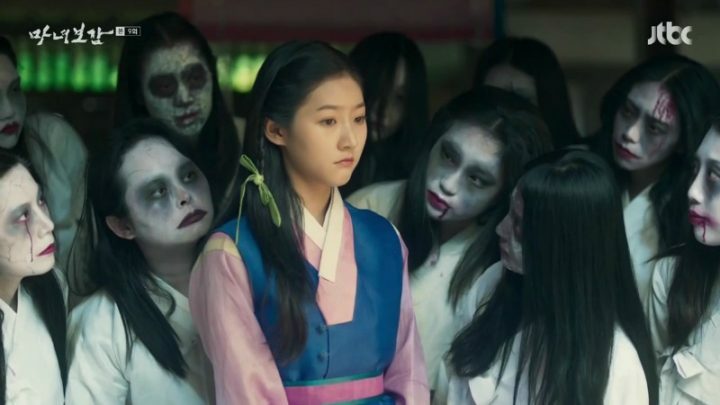 Princess Yeon Hee (Kim Sae Ron) and her brother the Crown Prince are cursed babies where everyone that they love and loves them will die. Evil Shaman Hong Joo (Yum Jung Ah) convinces the queen to transfer the curses to one baby and end that baby’s life. Yeon Hee is chosen as the sacrifice since she cannot succeed the throne. However, Taoist and Hong Joo’s teacher, Hyun Seo (Lee Sung Jae), manages to save her life and raises her in secret. 17 years pass by and we learn that Yeon Hee has been hidden away in a forest her whole life, with no knowledge of her family or her curse. Her family now appears to be Hyun Seo, whom she calls father, and his son Poong Yeon (Kwak Si Yang), who is actually in love with her since they were young. We also meet our hero, Heo Jun (Yoon Shi Yoon), a young scholar born to a slave mother. He’s working hard to buy his mother out of her slaver contract. Despite his feisty, defiant facade, we can see that he’s actually a quite lonely and sad soul. 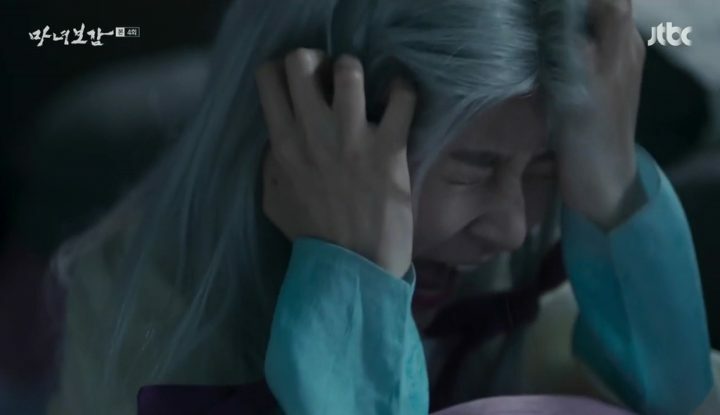 I think Yeon Hee and Heo Jun are going to make a good match and console each other as they both question their existence in society and live in isolation. I find some of the conflicts a bit of a contrived setup. Unfortunately, the first few episodes are not without faults. I find some of the conflicts a bit of a contrived setup where they could have been resolved if Hyun Seo had told his son the truth about Yeon Hee’s curse. Instead, he leaves him blind to it, and as a result, things go awry. I hope the drama will show us more logically sound plot developments in the coming episodes. A lot happens during these episodes of Mirror of the Witch to kick our emotions into high gear as we watch past mistakes and secrets being brought to light. Hong Joo is on a mission to kill Yeon Hee when she realizes that she’s actually still alive. 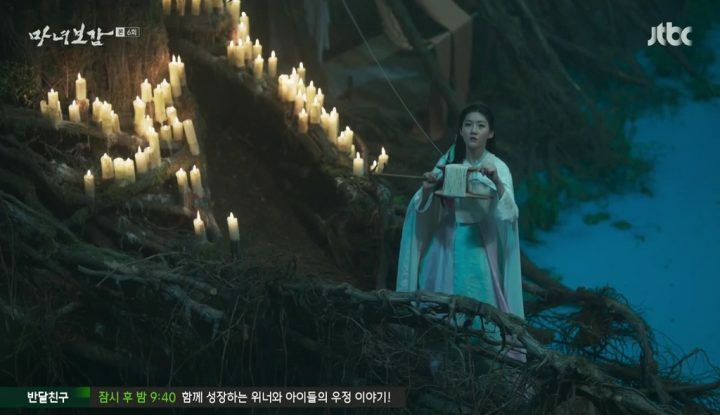 She resurrects Hyun Seo, who died trying to protect Yeon Hee, and obtains a sacred book from him that is quite important in terms of powerful curses and potions. Meanwhile, Yeon Hee manages to escape and get to the Temple, where she spends the next five years. We learn that she needs to light a little over 100 candles to break the curse. But this is proving to be a daunting task especially with Hong Joo’s interference. Her only ally here is Hyun Seo’s disciple, Yo Gwang. On the other hand, Heo Jun’s life has not been a walk in the park either. His mother gets murdered by his stepbrother, causing a drastic shift in his character. In my opinion, the drama does a great job of transitioning his character from a defiant brat to a much more filial and humble person. He serves his family well, and doesn’t snap back anymore. This is also a testament to Yoon Si Yoon’s flexible and believable acting where he’s able to portray two sides to the character with ease. 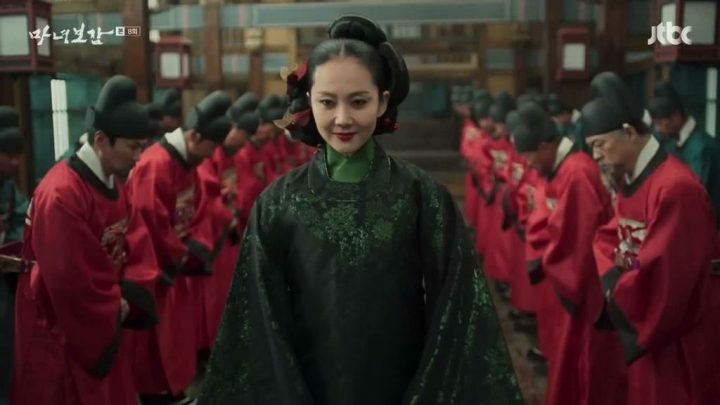 After the five-year time leap, we see that Hong Joo is appointed back within the King’s court, thanks to her manipulation of the King, making it easier for her to keep a close eye on traces of the princess. 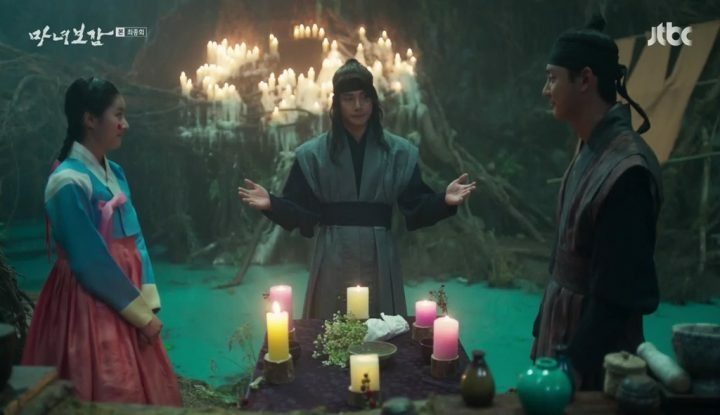 At the same time, she’s enhancing her dark powers via a man in red cloak and wood mask, who goes around killing people and stealing their hearts for Hong Joo. The murderer has an immense creepy vibe to him and it makes me rather curious about his identity. 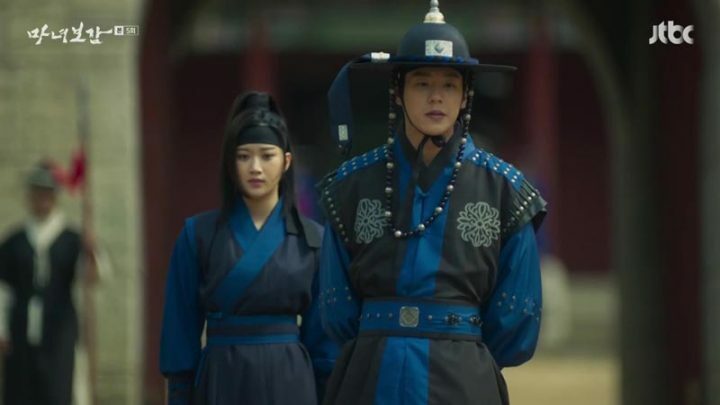 Poong Yeon is now a royal guard, and he’s also looking for his old friend Yeon Hee. Although Heo Jun and Yeon Hee are reunited, I’m not sold on the romance quite yet. Heo Jun and Yeon Hee have been separated for too long for an actual romance, but as a team to take down Hong Joo, I’m sure they’ll be great and I look forward to their plan of attack. These episodes of Mirror of the Witch ramp up on action scenes as everyone rushes to make their moves. Whether it’s forming alliances or breaking them, the drama carefully orchestrates the characters’ next meditated actions. It’s disappointing that the drama is intentionally prolonging the resolution. 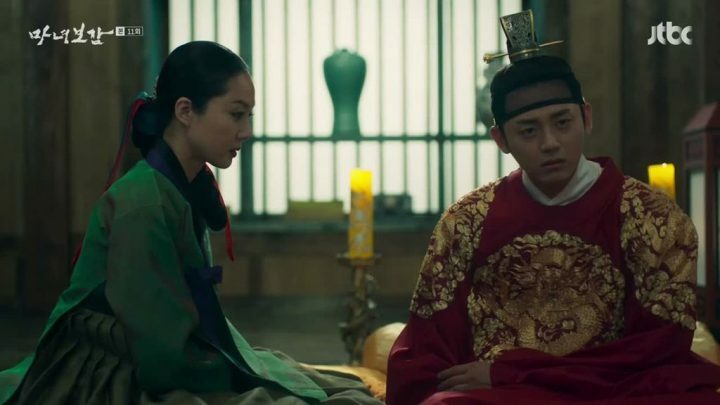 The King is easily manipulated, as Hong Joo promises to rid him of his illness. 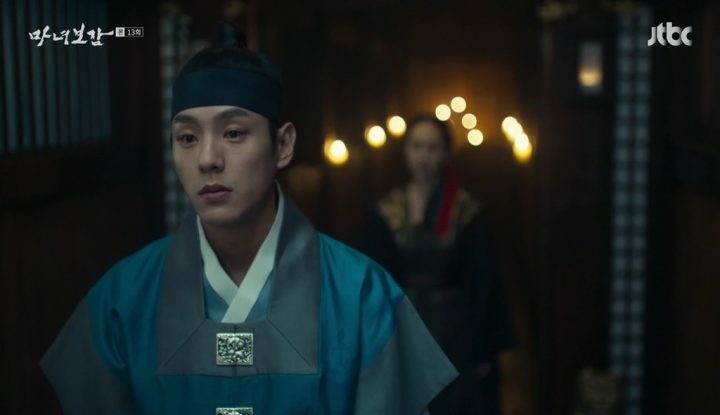 He’s being fooled into thinking that his throne will only be secure if Yeon Hee dies. At the same time, we finally find out who the red cloaked murderer is and it’s rather unexpected. I actually really appreciate how well the twist is handled as characters are able to use this knowledge to their advantage to thwart Hong Joo. 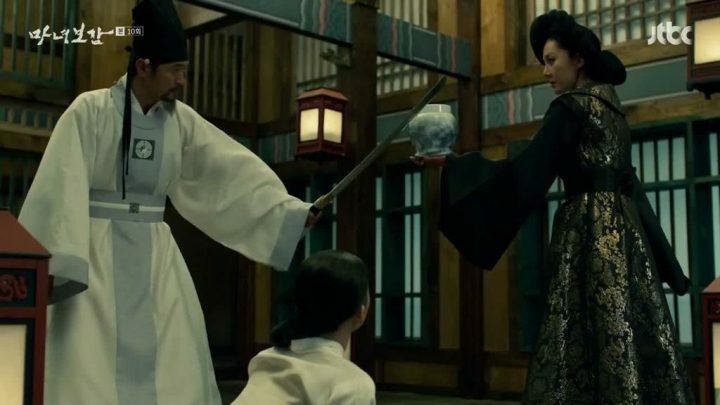 However, several opportunities to kill Hong Joo come up, but there’s always a reason not to. I’m disappointed as it seems like the drama is intentionally prolonging the resolution so it can be unnecessarily stretched out to the full twenty episodes. We also find out that Heo Jun is the key to lighting the last candle and curing Yeon Hee of her curse, as he loves her the most. I’m curious to see exactly how his love for her will play out; will he end up becoming a sacrifice, or will he be able to save Yeon Hee at all? 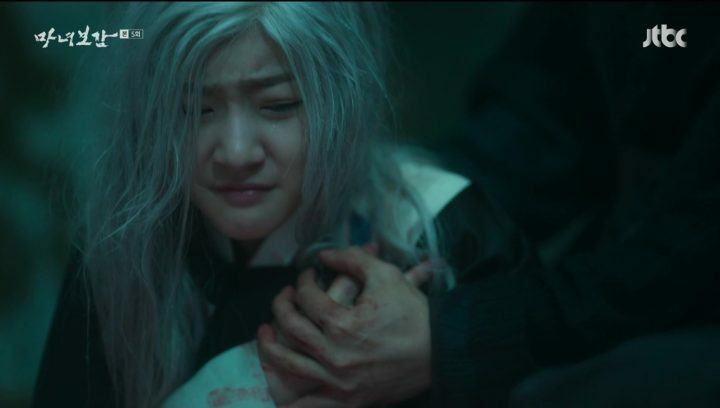 During this set of episodes of Mirror of the Witch, our characters are making their last preparation towards battling Hong Joo. Unfortunately, it took longer than I would have liked. Seemingly uncharacteristic conflicts were introduced, which made the drama feel unnecessarily long at times. Although our heroes manage to catch Hong Joo, Poong Yeon falls for her tricks and sets her free, much to my chagrin. Poong Yeon originally loved Yeon Hee and wanted nothing but the best for her. 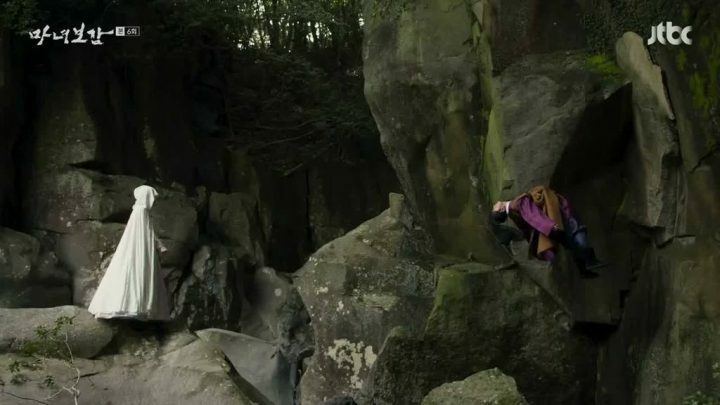 However, throughout this adventure where Yeon Hee discovers herself, her powers, and curses, he remained stubbornly static and wanted her to return to the sheltered girl she used to be. I’m not a fan of this side of his character as it seems a bit forced and pre-mediated in order for him to cause bad twists. But, it does serve as a good contrast against Heo Jun, who only wants to aide Yeon Hee without controlling her. Meanwhile, due to circumstances that I won’t spoil here, Yeon Hee ends up in the King’s prison. This whole sequence along with Poong Yeon’s distraction with Hong Joo can easily be cut from the drama to make everything a little more concise, rather than dragging on. As we get thrown into the last arc of the Mirror of the Witch, things come to a natural resolution. Hong Joo gets her comeuppance, not a moment too soon. Despite the loss of an innocent life during the final battle, justice prevails and peace is restored, leading to a bittersweet ending. I can confidently say that I’ve enjoyed the drama’s run for the most part. While the writing can be slow and shaky at times, the unique dark theme and top-notch acting really helped it shine and stand out on its own. The dark fantasy, heart-throbbing drama, and the dab of humor complemented each other to create a well-written drama with a unique story.